Last time, Noelle and Europa were living it up in France. The vacation isn’t quite over yet, even though I’m sure Europa wished it was. Noelle is unflappably French and is unfazed by her daughter leaving her stranded in the front yard without any clothes. She doesn’t even bother getting dressed before chowing down on some pizza for breakfast. Sorry. She’s got you dead to rights here. Might as well keep your mouth shut. Noelle continues to throw parties and Europa meets another man whom she shares a trait with. Their little affair is much like the last time. Nothing comes of it, though. At the end of the night, he leaves and they don’t really talk again. Poor Europa just can’t win! Yves Desmarais crashes another one of Noelle’s parties and Europa is quick to greet him. They share the “Brave” trait and actually seem to find one another remotely attractive without the aid of nectar. This is a good start! Unfortunately, being the inappropriate sim that Europa is, she instantly takes things too fast and has another party woohoo session. Surprisingly, though, Yves doesn’t just stride off once the party ends, he stays. He even stays through breakfast and isn’t the least bit thrown off by Europa opting to have just a glass of nectar for her morning meal. Instead, he compliments the house and just makes pleasant conversation. I’m pretty impressed. For a one night stand, this is turning out rather well… Europa actually seems to like him, too… even if she seems rather indifferent on the surface. By the end of the vacation, Yves has practically moved in. He refuses to leave. It’s pretty hilarious. Europa doesn’t seem to mind, because now she finally has someone to hang out with that isn’t partying or streaking in the hot tub all the time. She does kind of wish Noelle would show a little more class around her boyfriend, though. Hopefully this takes her mind off that sparkly vampire, Bert. Before they leave, Europa spins up this wish. Sorry, the house is kind of near capacity at the moment. I don’t really want to move in anymore people until Titania and Mercury are gone! I’ll keep it in mind that you wished for that, though, Europa. Noelle and Europa return home and I breathe a sigh of relief. I’m not sure I could have kept up with Noelle’s crazy partying any longer. Now she’s back to her boring life of smooching up her husband and making nectar. Europa picks up a new hobby and tries mixing drinks… she’s not the best at it. 4 comments to Generation Nine: Surprise! 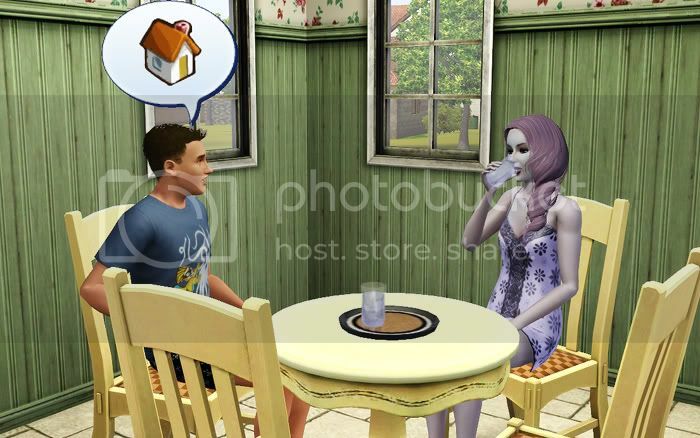 I really hate how that “Move In With X” wish isn’t fulfilled unless you have your Sim move in to X’s house. I mean, seriously, do they want the Sim or the house? 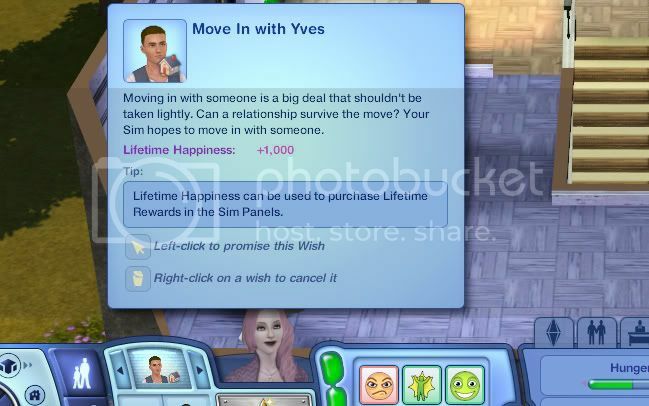 And it’s really fiddly to have to go to the other Sim’s house to move your own Sim in and in this case, seeing Yves isn’t a playable, it would be impossible. Yves is pretty adorable though. I think that world is known as 2008, or rather, a very brief period in 2008. EA are so with it. That shirt came with Late Night, I think, which came out in what, 2010? LOL! What’s up with Luna and Aludra? I thought animals were supposed to sense when they were in the presence of pure evil and react accordingly! So what will you do now that Gen 10 is on the way? Keep playing to get Callisto reach her LTW, or stop with the baby, as per the rules? You know, I think I had forgotten about that. What a crappy wish! HA! I was thinking the same thing. That shirt is ridiculous. 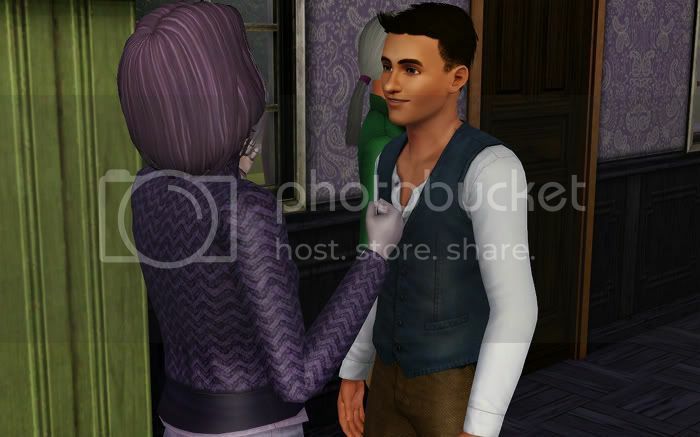 Wasn’t there one like it in TS2: Nightlife? LOL! 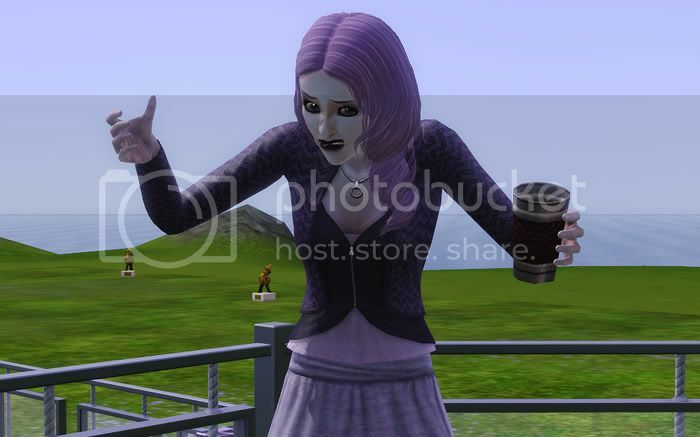 I think cats would naturally lean towards evil sims. I mean, come on, look at villains in movies, they always have a cat! I imagine Aludra stroking Luna while sitting in a high-backed swivel chair and laughing maniacally. I am not sure yet. I am pretty amped to start on my prosperity and this hood is getting glitchy (the save file is now like 3+gigs), so probably just until she has her baby. I did try to fulfill Callisto’s LTW, though. Oops! Ha, I think Europa is in a hurry to finish this whole legacy business so she’s going to bring in the 10th generation on her own terms! Looking forward to finding out who the father is. That was definitely a memorable trip, lol! She really is! She wants her freedom and to be rid of me… ha. I know! I was a little worried about it at first, but I’ll go ahead and say that it was Yves. Thank goodness!